If you want an amazing aerobic workout in the comfort of your home, a treadmill is a fantastic choice. Walking, jogging and running on a treadmill can deliver impressive cardiovascular improvement, effective weight-bearing exercise for your bones, top-notch toning for your legs and a great way to burn calories and fat. And you've chosen the ideal time to shop for a new treadmill for your home. These days Powermax Fitness is offering a wide range of user-friendly treadmills in varying price points, all designed to offer you a high-quality treadmill with the features you want and need. There are multiple treadmills that are also useful for any age person; even old age person who is suffering from orthopedics can also use treadmills. Orthopedics is a disorder of the bones, joints, muscles, ligaments, tendons, nerves and skin. These elements make up the musculoskeletal system. Which Treadmills are Preferable for Orthopedics? From orthopedics to physical therapy, the PowerMax Fitness Treadmill provides comfort and assistance to patients who require walking support. These two treadmills TD-M4 and TD-A4 can accommodate any user’s pace with an absolute zero start speed with increments max till speed of 15km/hr. Our patented Slat running surface helps absorbs more of the impact than any other treadmill, preventing further deterioration of bones, tendons, ligaments, and muscles in the lower extremities, pelvis, and lower back. The Powermax Treadmills is the ideal machine for peoples that require walking support. The medical grade, fully adjustable handrails are infinitely customizable in width and height to provide a comfort level that is unmatched by stationary. With a powerful motor, large running surface, and impressive console, the UrbanTrek Treadmill TD- M4 is hard to beat. This treadmill’s combination of functionality and performance made it an easy choice for one of our best home treadmills of 2019 and also one of the best treadmill recommended by research for Orthopedics. Let’s talk about the console, which boasts a LED Display- Time, Speed, Distance, Calories, and Heart Rate with sensor on Console Tube. Train solo or sweat along world-class trainers, all in the comfort of your home! Now, let’s talk about performance – this treadmill has that covered as well. The workout surface is oversized, leaving plenty of room for long strides when running, and it features Power Flex Precision Cushioning. The powerful 2.0 HP HiTorque LAMMER DC motor revs up workouts with speeds up to 14 km/Hr, and you can challenge yourself. And when you buy from a brand like PowerMax Fitness, you know you’re getting a durable machine that’s built to last. The PowerMax Fitness TD-M4 comes with Lifetime frame and 3 years motor replacement warranty to back up that commitment to quality. What else makes this treadmill great for home use? Its space-saver design, for one. It’s foldable and easy to store. Plus, the motor is designed to reduce noise. Overall, the PowerMax Fitness TD-M4 is ideal for every fitness level and offers an abundance of entertainment options to keep your workouts spicy ad exciting. Typically priced, this treadmill packs in a lot of value! The PowerMax Fitness Treadmill TD-A4 is at the top of its class and an easy choice for one of our best treadmills of 2019. With a powerful motor, a large touch screen, and a cushioned running track, this treadmill does it all! When it comes to power, the PowerMax Fitness Treadmill TD-A4 boasts a big 2.5 HP Hi Torque DC Motor that ramps up to 18 Km/Hr. And it makes your in-home workouts smoother and quieter than ever. The bigger motor also makes this treadmill great for use, and the company includes a lifetime frame and 3 years Motors warranty. Along with that powerful motor, you can create a challenging workout with a varying Auto incline of up to 15 percent. Or option for varied workouts and terrains. Burn more calories and train for any hill or valley. 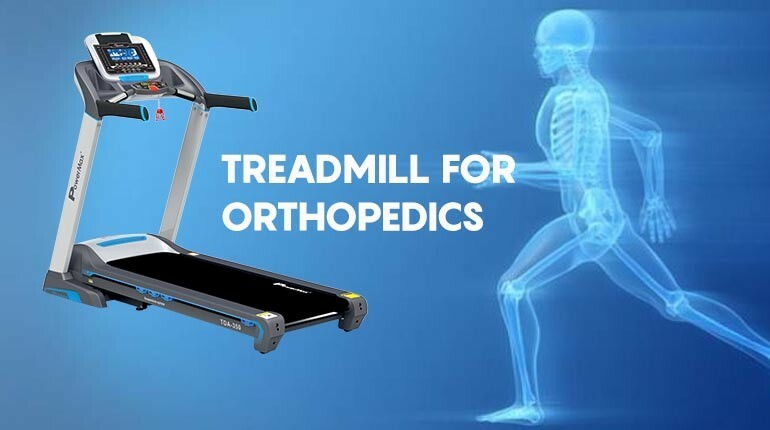 People suffering from orthopedics should use this treadmill as it is specifically designed for them. Orthopedics Runners will also love the roomy deck with a 8- High tensile suspensions encapsulated with Apex Silicone Layer, and Rubber Cushion Base damping system for better shock absorption to reduce stress on your joints . The PowerMax Fitness Treadmill TD-A4 is maintenance-free, perfect for daily workouts at any intensity. If you’re looking to splurge a bit to get an upgraded treadmill, then buy the PowerMax Fitness Treadmill TD-A4. As one of the top-rated treadmills of 2019, this treadmill is sure to please!